Photo courtesy of Cam Hutchins. PW Trenchless Construction Ltd. But that’s changing, according to two presentations at the Trenchless Technology Road Show, held November 17-19 in Vancouver, as governments set stricter GHG reduction targets and develop better systems for tracking emissions. Tougher GHG requirements come as Canada faces a $31-billion bill over the next 20 years to replace aging water and waste water systems alone, according to the Federation of Canadian Municipalities. What’s more, when most of these utilities were installed, they were next to two-lane roads that have grown into bustling thoroughfares. “Now we’re tasked with replacing all that infrastructure. Can we dig the streets up any more to do it? We can, and we do, but it causes horrendous traffic problems, and it’s a very expensive way of doing things, as well,” said O’Sullivan. So just how do trenchless technologies help cut GHG emissions? For Shaun McKaigue, CEO of FER-PAL Infrastructure, it comes back to the three Rs: reduce, reuse, recycle. The GHG savings such an approach can yield are impressive: according to a 2007 report from the Centre for the Advancement of Trenchless Technologies at the University of Waterloo, trenchless pipe-repair methods deliver upwards of 78 percent lower GHG emissions when compared to open cut. “The reduction in emissions associated with trenchless construction are achieved mainly due to its shorter job duration using less construction equipment and limited or no disruption to traffic flow,” reads the report. Truckloads are a big factor when comparing open cut and trenchless on both a GHG and cost basis, particularly when it comes to removing fill from the job site. Last year, for example, McKaigue said FERPAC completed a job in which it replaced 980 metres of pipe using CIPP. As a result, it needed just 76 truckloads to remove fill vs. an estimated 864 for open cut. “That just drives home the point that there is a huge saving just in the amount of money it takes to remove the material,” said McKaigue. It’s not just big things, like the amount of fuel burned by construction equipment, that make a difference, he said. There are plenty of smaller steps that can make CIPP even more environmentally friendly, like using recycled asphalt, locally sourced lumber and reusable pipe to provide temporary service to homeowners while the main repair is being carried out. “Every one of these steps are incremental, but I think they add up,” he said. Tougher GHG reduction goals also mean it’s no longer enough to simply claim that technologies like CIPP are a “green” alternative. Municipalities increasingly have to show their work. That’s where a new carbon calculator developed by B.C.-based Strategic Carbon Management, in collaboration with the B.C. 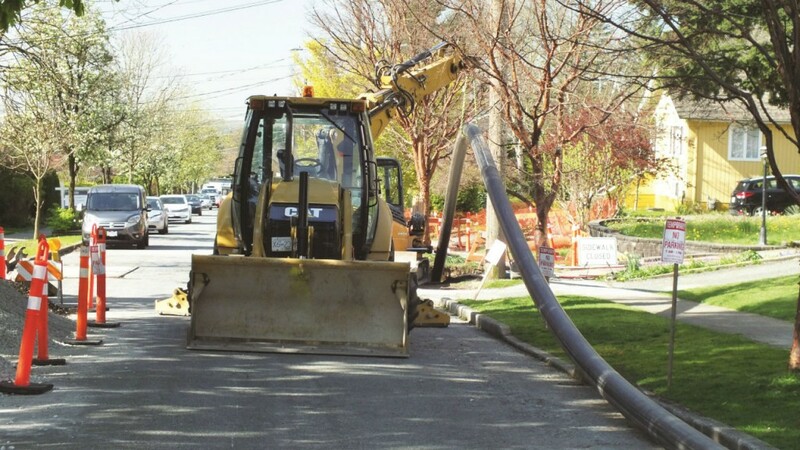 chapter of the North American Society for Trenchless Technology (NASTT-BC), PW Trenchless and Metro Vancouver, comes in. The system lets municipalities calculate carbon savings by comparing trenchless jobs with similar open-cut scenarios. The goal is to use GHG reductions from their trenchless programs to offset emissions from their day-to-day operations. Using data inputted by the user, the system – which is free to use and adaptable for use outside B.C. (and Canada) – estimates excavation volumes and durations, as well as emissions from trucks and other machinery. It then compares this data with a similar open-cut scenario and shows the savings in both raw tonnes of GHG and on a percentage basis. The calculator covers 12 different trenchless technologies, including CIPP, pipe bursting, pipe jacking, horizontal directional drilling and sewage lining. “There is no other tool existing that has this many technologies and, I would dare say, this level of rigour and detail,” said Rouhany.